As Iran and the world powers resume nuclear talks in Vienna with the hope of reaching a comprehensive agreement over Iran’s nuclear program by mid-July, the Israelis and their lobbyists in Washington are intensifying their efforts to scuttle the talks. In addition to all the efforts in the US Congress to impose additional sanctions on Iran, thus bringing the talks to a premature end, there are indications that Israel and her friends are continuing with various acts of sabotage against Iranian nuclear facilities. In 2010, the so-called Stuxnet virus temporarily disrupted the operation of thousands of Iranian centrifuges. At least five Iranian nuclear scientists have been assassinated. Iran has also said that it has discovered tiny timed explosives planted on centrifuges but has disabled them before they could go off. On Monday 17 March 2014, Iran said that an alleged attempt to sabotage one of its nuclear facilities had involved foreign intelligence agencies that had tampered with imported pumps. However, in addition to all those acts of sabotage, there seems to be an intensive effort to manufacture a crisis by means of false intelligence. Prior to the devastating Iraq war that destroyed the country and killed upwards of half a million people, not to say anything of thousands of Coalition forces who were killed and the two trillion dollars that was spent, a number of neocons bent on the invasion of Iraq manufactured various false reports in order to mislead the public and pave the way for the war. The unsuspecting public was misled by that false intelligence and the result was one of the longest and most disastrous wars in US history. In this book Porter shows how Israeli agents have fabricated many stories in order to accuse Iran of trying to manufacture nuclear weapons. He also shows how the IAEA has been manipulated to put out reports suggesting that Iran had a covert weapons program. One instance of the false intelligence is the story of how some documents allegedly stolen from an Iranian nuclear weapons research program became a primary driving force in building a consensus about an Iranian covert program. Around the same time, in the absence of any proof that Iran was trying to get nuclear weapons, the Israelis decided to create a file of documents, which would be attributed to a covert nuclear weapons program. They got the terrorist group the Mojahedin-e Khalq to make the public case on behalf of Israel about the existence of a covert military program in Iran. A major revelation in the book concerns the account provided by a former senior official in Germany’s Foreign Ministry, Karsten Voigt, who was in charge of German-U.S. relation from 1997-2013 and who had warned his U.S. colleagues that the information about Iran’s nuclear program had come from a member of the Mojahedin-e Khalq and was unreliable. The German Intelligence Service, the BND, had warned the Americans during the run-up to the Iraq war that a source used by American officials, now known as Curveball, whose false stories about mobile bioweapons lab had been used by Colin Powell in his UN speech could not be relied upon. However, it seems that the aim of the policy-makers is not to ascertain the truth, but to make use of any material that backs their policies. However, faulty intelligence has enabled some US analysts to claim that Iran has a large-scale nuclear weapons program. However, none of these assumptions have been based on facts. Porter writes: “US and Israeli policies have been driven by political and bureaucratic interests, not by a rational, objective assessment of available indicators of the motives and intentions of Iranian leaders”. Nevertheless, the same faulty intelligence has enabled the West to take Iran’s file out of the IAEA and into the U.N. Security Council and to impose unprecedented sanctions on Iran that have gravely affected Iranian economy and the lives of millions of Iranians. It is clear that despite some setbacks the Israelis still continue to demonize Iran by any means possible. On the eve of Benjamin Netanyahu’s visit to Washington early in March 2014 to meet with President Obama and speak at the annual AIPAC conference, suddenly a story grabbed the headlines of most Israeli and US newspapers about the Israeli Special Forces seizing an Iranian ship with missiles heading from Iran to Gaza. The Israelis say that it was due to dock in Port Sudan, from where the weapons would have moved overland through the Sinai Peninsula and ultimately into the Gaza Strip. The fact that many parts of the story do not add up does not seem to bother anyone as long as it provides a backdrop to Netanyahu’s appearance in Washington. Why in the midst of a war would Syria send some of her most sophisticated weapons to Tehran to be then sent to Iraq before heading back to the Persian Gulf and the Red Sea to go through the Sinai Peninsula that is in the midst of intense insurgency activities, to then be sent to the Gaza Strip through the tunnels that have been destroyed by the new Egyptian regime? And why it is acceptable for Israel to intercept the ship heading for Sudan in international waters? These are some of the questions that need to be answered. It seems that those who concocted this story did not even know that since the start of the Syrian crisis Iran has broken with Hamas, which has clearly sided with the rebels. At a time when the Iranian government is getting close to the West and is on the verge of make-or-break talks with the West, why would Iranian leaders jeopardize the success of the talks by trying to smuggle weapons to Hamas, with which they have hostile relations? Shortly after 9/11 when the then reformist government of President Mohammad Khatami expressed condolences to “the great American nation” and collaborated with the Americans in Afghanistan and a new chapter of more friendly relations was about to open up between Iran and America, we had a similar incident, the so-called Karine A affair. In that incident too, commandos from Israel’s Navy seals unit allegedly swooped on the Karine A in international waters in the Red Sea, overpowering the crew of the ship and seizing the weapons that they claimed were intended for the Palestinian Authority headed by Yasser Arafat, with whom Iran did not have very warm relations. Ariel Sharon stood on the dock at Israel’s Red Sea Port of Eilat displaying the alleged weapons that had been seized. The illegal seizure of the ship in international waters achieved Sharon’s two main aims. It blew up the faint hopes of peace with the Palestinians, and at the same time it put an end to any rapprochement between Iran and the United States. If in the case of Iraq Western leaders could claim that they were not sure whether Iraq was pursuing nuclear weapons or not – although the “Dodgy Dossier” and fabricated intelligence by the Office of Special Plans created by Paul Wolfowitz and Douglas Feith suggests otherwise – in the case of Iran they do not even have that excuse. At least since 2003 when an Iranian negotiating team led by Hassan Rouhani and the European Troika (Great Britain, France and Germany) reached an agreement on Iran’s nuclear program and Iran signed the Additional Protocol and even suspended enrichment for over two years, and certainly since 2007 when the NIE said with “high degree of confidence” that Iran did not have an ongoing nuclear weapons program, the world has known that all the hype about Iran’s nuclear weapons was only aimed at manufacturing a false crisis. 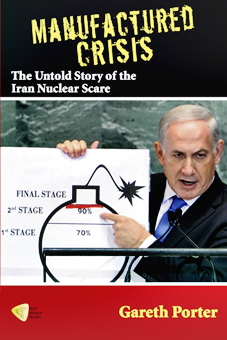 It is in the light of all these previous experiences that Gareth Porter’s A Manufactured Crisis is of such great significance, because it shows once and for all with meticulous documentation the nature of the lies concocted by Israel against Iran. The question is why the information provided by the book is not at the top of the news in the Western press? Why is the case against Iran not reviewed in the light of these revelations and why has a final deal not been reached? What are the negotiators waiting for and what else do they need to have in order to be convinced of the peaceful nature of Iran’s nuclear program? Why is the public so quiet about all these lies and distortions, and why do they not speak out against a manufactured crisis that could affect us all? Why are Israeli officials who have been guilty of such willful distortion of truth not brought to book and condemned by the international community? Are we not colluding with all these lies and disinformation by remaining silent? The Soviet dissident author Yevgeny Yevtushenko said: “When the truth is replaced by silence, the silence itself is a lie.” It is time for all of us to speak out and put an end to all these lies. TFF Associate Professor Farhang Jahanpour is a part-time tutor in the Department of Continuing Education at the University of Oxford and a member of Kellogg College. Read other articles by Farhang, or visit Farhang's website. This article was posted on Saturday, March 22nd, 2014 at 2:15am and is filed under Book Review, Iran, Israel/Palestine, Media, Propaganda, The Lobby.